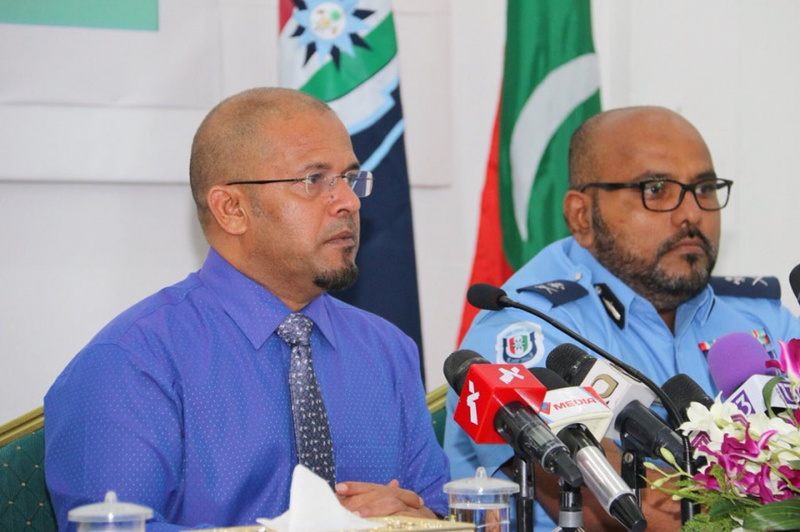 The Maldives Police Service will provide equal opportunity for all presidential candidates to campaign, but such campaign activities need to be held within the bound of law, says Acting Commissioner of Police, Deputy Commissioner Abdulla Nawaz. Answering a question by “Sun” after signing of the Memorandum of Understanding between the Elections Commission and Maldives Police Service for safety and logistical support for the upcoming Presidential Elections, Nawaz said the biggest responsibility of MPS as the institution in charge of executing law and maintaining security in Maldives is to provide equal opportunity for every activity. He said the opportunity will be provided for every activity held within the bounds of law. “The police will provide assistance to all parties as long as its carried out without violating the law, within set bounds, and within the standards set by the Elections Commission,” said Nawaz. Speaking at the signing of the MoU, President of EC, Ahmed Shareef said the MPS will maintain security of the 477 ballot boxes which will be kept for the Presidential Elections both in Maldives and outside the country. Shareef said the MPS will also assist in transporting ballot boxes from one location to the other. He expressed confidence the election will go smoothly.